SASI athletes again did their state proud with outstanding efforts at the recent diving Australian Elite Junior Championships in Hobart. Macie Wheeler, Amelia Linton (above, centre) and Kate Rosman all won medals in their respective events with Macie and Amelia winning selection in the Group C national squad for 2018/19. 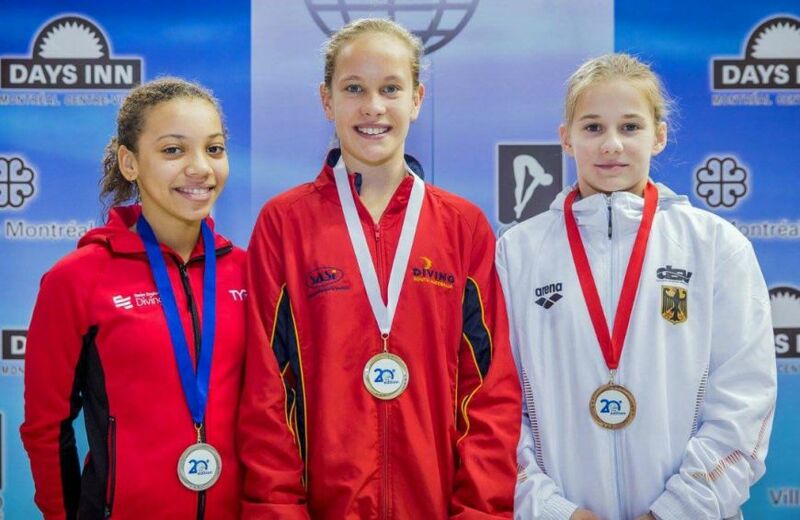 Macie had a top competition with gold medals in the Junior C 1metre and platform, Amelia snaring silver in the Junior C 1metre and platform and bronze on the 3metre, while Amelia and Macie finihsed fourth in the synchro - missing the bronze by 1.59m. Kate also competed strongly in the Junior A by winning bronze in the 1metre and 3metre springboard. Macie (pictured below) also took out the individual Group C award presented after the championships for her results during the event. Another star SASI athlete, Matthew Carter, did not take part in the Hobart event as he was competing in a World Cup event in China. After a short rest Matthew is back in training at the SA Aquatic and Leisure Centre with his next big target not far away – the World Junior Diving Championships in Kyiv, Ukraine, between July and 29. A successful competition there would see the young champ grab a place on the Australian team for the Youth Olympics in Argentina between October 6 and 18 this year.